The two dominant business models for venture-backed startups are advertising for consumer-focused companies, and Software-as-a-Service (SaaS) for business-focused ones. On one level, these business models are quite different: the former gives away software for free with the hope of convincing a third party to pay for access to users; the latter charges some portion of users directly. The underlying economics of both, though, are more similar than you might think — indeed, both are very much in line with venture-backed startups of the past. Silicon Valley is, unsurprisingly given the name, built on silicon-based computer chips, and that goes for Silicon Valley venture capital, as well. Silicon-based chips have minimal marginal costs — sand is cheap! — but massive fixed costs: R&D on one hand, and the equipment to actually make the chips on the other. And while those two costs live on different parts of the income statement — the latter is a cost of revenue that impacts gross margins, while the former is “under the line” and an operational cost that only impacts overall profitability — the fundamental economic rationale for taking on venture capital is the same: spend a lot of money up-front to develop and build a product, and take advantage of minimal marginal costs to make it up in volume. You can see how this model translated perfectly to software: marginal costs were even lower, and an even greater percentage of costs were R&D. Companies needed lots of money to get started, but those that succeeded could generate returns that vastly exceeded the amount of investment. This is certainly the case for today’s business models. Advertising-based consumer companies spend huge amounts on R&D building products that appeal to users, although usually not a lot on sales and marketing to acquire users; consumer companies that break through to the scale necessary to support advertising rely on viral network effects. Where the sales and marketing spend comes is in courting advertisers; however, the most valuable consumers companies of all — the super-aggregators — generate the same sort of network effects allowing them to add advertisers in a scalable way as well. 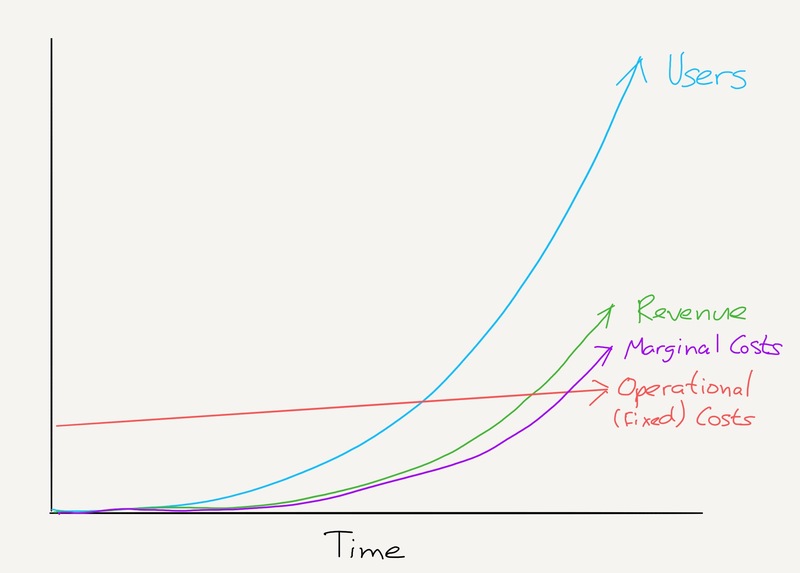 This produces the ideal venture outcome: a company where users and revenue grow far more quickly than costs. Again, this is possible because there are minimal marginal costs — more users are not necessarily more expensive. 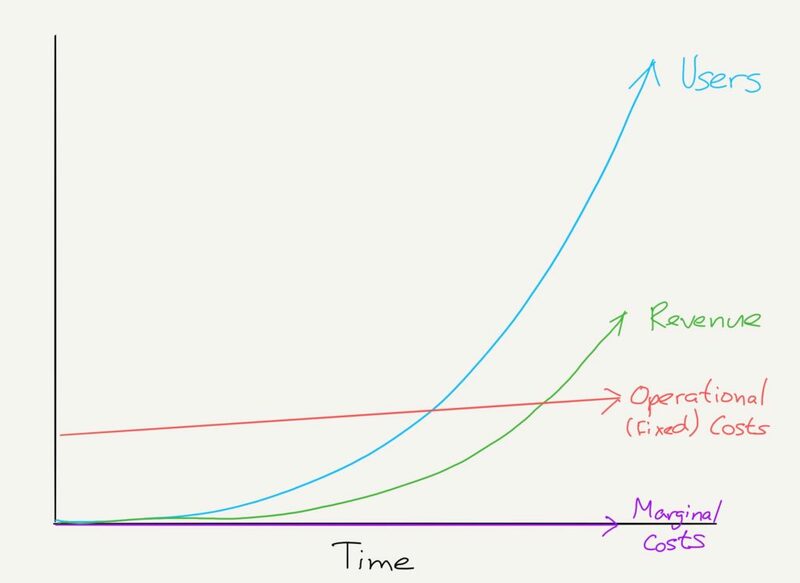 Of course fixed costs grow over time, but they only grow linearly — earning ever-increasing revenue on a relatively stable cost basis is the definition of scale. SaaS businesses have the same sort of profile — the big difference is that revenue comes from users, and thus sales and marketing expenses are spent on gaining said users, not advertisers, but minimal marginal costs are the common thread. Margins, to a first approximation, don’t matter. Most businesses care quite a bit about their cost-of-goods-sold (COGS), the cost to satisfy a marginal customer. While some platform businesses (like AWS) have material COGS, at the typical SaaS company, the primary source of value is the software and it can be replicated at an extremely low COGS. SaaS companies frequently spend less than 5~10% of their marginal revenue per customer on delivering the underlying service. 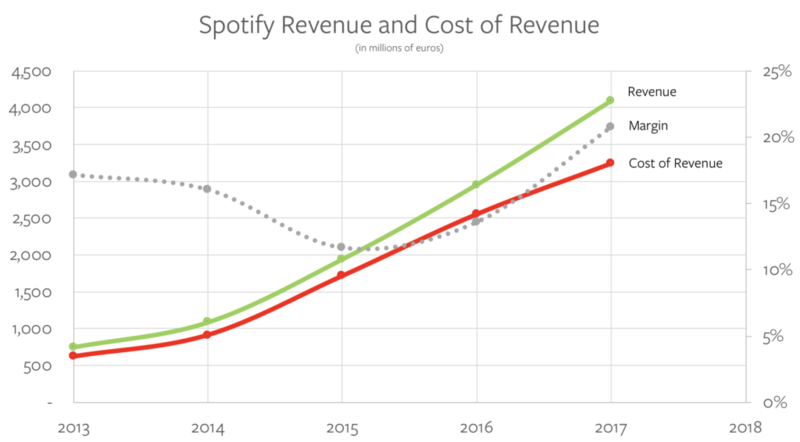 There’s just one problem: Spotify’s marginal costs. Spotify negotiated new deals with the record labels last summer that resulted in lower royalty rates in exchange for guaranteed subscriber growth and the ability for the labels to make some releases exclusive to Spotify’s paid tier; you can see those lower rates reflected in Spotify’s increased margins. Moreover, it seems highly unlikely Spotify’s Cost of Revenue will improve much in the short-term: those record deals are locked in until at least next year, and they include “most-favored nation” provisions, which means that Spotify has to get Universal Music Group, Sony Music Entertainment, Warner Music Group, and Merlin (the representative for many independent labels), which own 85% of the music on Spotify as measured by streams, to all agree to reduce rates collectively. Making matters worse, the U.S. Copyright Royalty Board just increased the amount to be paid out to songwriters; Spotify said the change isn’t material, but it certainly isn’t in the right direction either. Most obviously Spotify could try and lower its operational costs. This, though, is harder than it might seem for two reasons: first, Spotify is already a pretty frugal company; Dropbox, for example, which filed its S-1 the same week, spends 77% of revenue on operational costs as compared to Spotify’s 30%. Spotify could grow its revenue without increasing its operational costs. How, though, will it grow revenue if it cannot increase its spending on R&D and Sales & Marketing? The typical pattern for non-social network companies is for Sales & Marketing to grow less efficient over time, which means it would need to increase as a percentage of revenue, not decrease (and remember, Spotify can’t afford to miss its growth numbers or its royalty rates go up). There is one more possibility: Spotify could one day cut out the labels altogether — the idea certainly makes sense on a conceptual level. Spotify is in one sense an aggregator, in that it increasingly controls access to music listeners, and to the company’s credit, it has demonstrated the ability to exercise power via its control of music discovery and popular playlists. Notice how little power Spotify and Apple Music have; neither has a sufficient user base to attract suppliers (artists) based on pure economics, in part because they don’t have access to back catalogs. Unlike newspapers, music labels built an integration that transcends distribution. Spotify is an impressive product and company, and CEO Daniel Ek and team deserve credit for reaching this point. Being a true aggregator, though, means gaining power over supply; Spotify doesn’t have that — the company doesn’t even have control over its marginal costs — and it’s hard to see where the profits come from. 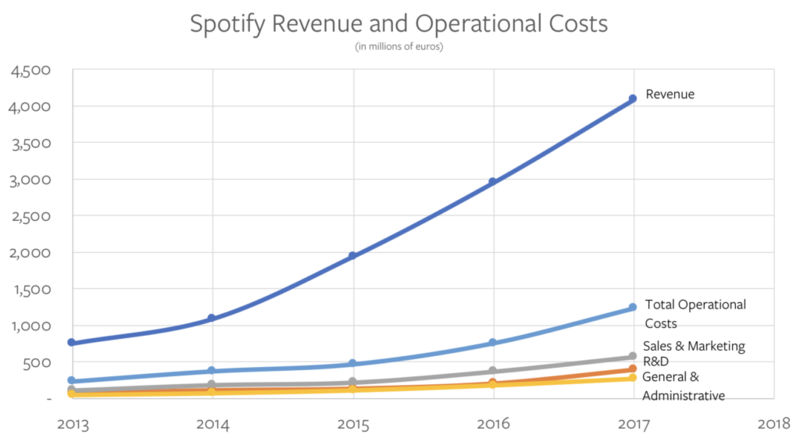 It’s worth noting, though, that Spotify is hardly the only well-known startup that has its cost of revenue linked to total revenue — at least from a certain perspective. Over the last few years there has been a third model of startup that has emerged: the so-called sharing economy, or Assets-as-a-Service (AaaS). When you spend $10 on an Uber or Lyft ride, around $7 goes to the driver; when you spend $100 on an Airbnb, $85 goes to the host,1 and so on and so forth. AaaS companies can’t assume that operational expenses are “free”, because gross marginal costs are going to eat up a huge portion of gross revenue growth. AaaS companies that can’t lower their operational costs or grow revenue relatively faster than Sales & Marketing will be left rolling the dice on eliminating marginal costs entirely. Granted, self-driving cars or owned-and-operated apartments may both be more viable than getting rid of the record labels, but it still seems a better bet to become far more disciplined when it comes to operational costs. I still believe in a future where Everything is a Service, and there’s no question that creating networks for everything will need a lot of venture capital. And make no mistake — there will continue to be capital available, because a network, once made, absolutely offers the sort of scalable revenue generation that makes generating significant profits an inevitability. 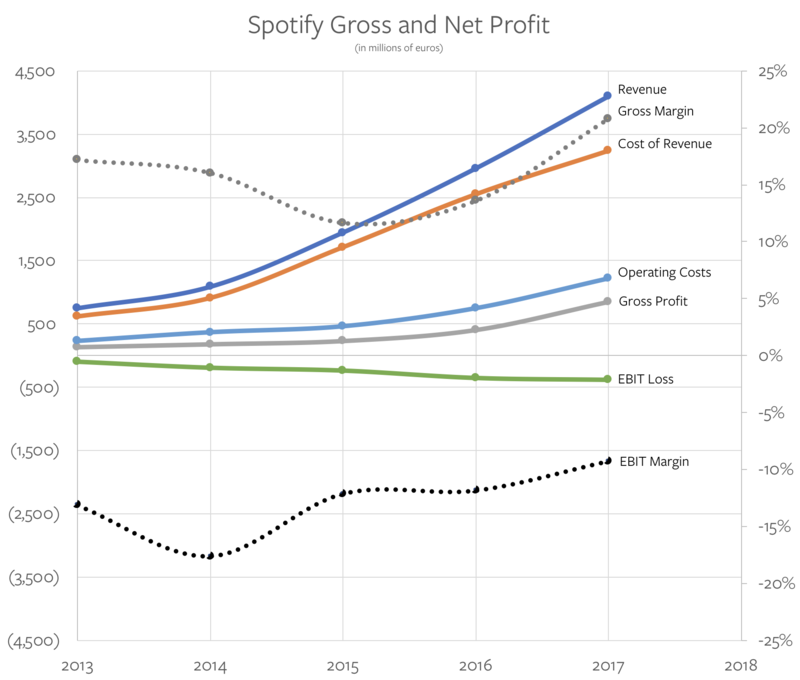 To that end, it is surely Spotify’s hope that the streaming market ends up being so big that the company’s low gross margin in percentage terms ends up large in absolute ones; even then those profits will come from operational excellence and efficient customer acquisition, not simply top-line growth.